Although we can access a reasonable amount of advanced power management features in Windows by default, if you’re a power user who want to get additional control over the power management settings, then you’ll have to use some sort of a dedicated utility. For instance, I use both Ubuntu and Windows 7 and Ubuntu (or modern GNU/Linux distributions in general) gives you some additional information about your laptop’s battery (such as the manufacture, original capacity, discharging rates in graphs etc). But in Windows 7, we cannot get those details, by default. So if you use Windows and want to access some of your hardware and their advanced power management settings from a single application window (CPU temperatures, HDD related power management settings, battery and its settings etc), then I think you might be interested in a small, yet an extremely powerful tool called “BattStat”. The name is a bit misleading, as it makes it look like a battery monitor (which it is). But it’s more than just a battery monitor as it lets you access few other settings too. *. 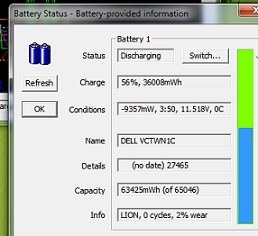 Yo can view the manufacture’s name of your battery, its type, original capacity and current capacity (plus “wear” rate), charge/discharge rate, time left before it completely wears out, Voltage readings, temperature levels (might not always be applicable) etc. run time, charge/discharge rate, current power usage! (in Watts), current CPU speed/load/temperature, HDD temperature, Aux temp reader (a temperature monitoring device embedded in your Motherboard) and better yet, just below the graphs, it shows you the average power consumption of your system as well. (thanks to this I just realized that Ubuntu 11.10 in it idle mode, actually consumes a lot more energy than Widows does, probably because it has disabled the Intel Sandy Bridge GPU power settings due to a bug). *. You can also adjust other settings such as: update interval, enable/disable run at system start-up, add a hot-key to turn off the display lid (useful if you don’t have a dedicated keyboard shortcut), adjust display brightness setting, disable the pretty Windows Aero theme (to save some GPU power) when running in Battery, and it even lets you adjust some advanced HDD related settings such as the drive spin-down and acoustics too!. *. Change between power schemes easily. *. When you move your mouse over to its notification area it shows you details such as the remaining battery time, CPU temperatures, power consumption rate and few other HDD related information. But importantly, if you right click on the icon, then you can put your system to Standby, Hibernate and turn off the screen using the menu, which can be pretty useful at times as Windows won’t let you access them that easily. *. It also has a “floating toolbar” as well. If interested you can get it from this BattStat home page. But remember, it’s not an open source tool but completely free to use anyway. A big thanks goes to “Thomas” for creating it. Good luck.